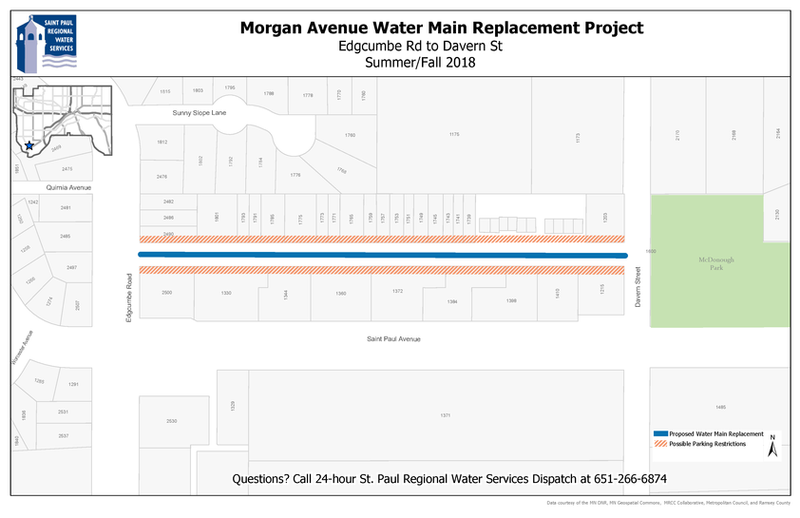 St. Paul Regional Water Services crews will be replacing the water main on Morgan Ave. from Edgecumbe Rd. to Davern St. The original cast iron water main installed in 1960, which has suffered repeated breaks, will be replaced with high density polyethylene pipe using a method called pipe bursting. During construction, access to homes and businesses will be maintained, but through traffic may be diverted around the area via detours and parking may be prohibited on both sides of the street. Water main installation was finished this week. The remainder of the week will be spent chlorinating the main, flushing and testing the water quality. Once our laboratory approves passing water quality results, crews will begin to reconnect water services to the new main. This is anticipated to being next week and last until around November 9. Morgan Ave. from Edgecumbe Rd. to Davern St.
New water main will be installed.